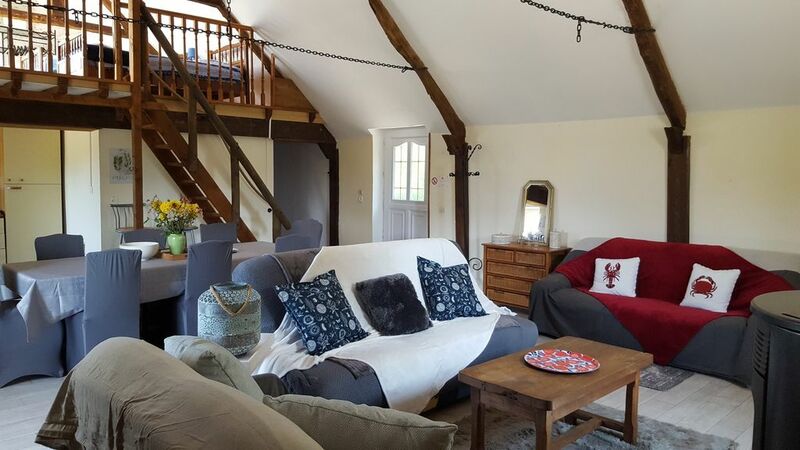 This beautiful cottage with stone and exposed beams, adjoining the house owners (very discreet), is located upstairs and has a private outdoor access with parking. Omaha Beach (Colleville sur Mer) is a 20-minute walk and a 5-minute drive. The cottage includes a large living room with open kitchen, a loft bedroom with three single beds, a bedroom with a double bed (+ an extra bed if needed), and a bathroom-toilet. A sofa bed allows sleeping two people in the living room. Accessible in a short time by car, the memorial of Caen (45 min), Chausey Islands (two hours), Mont-Saint-Michel (two hours). Très beau gîte, type "loft", beaucoup de charme, bien décoré et parfaitement équipé. Parfait pour une famille avec 3 enfants. Proche de la mer et des plages du débarquement. Vue sur un beau jardin. Accueil très sympa des propriétaires qui sont très serviables. Coast lanyard, Nordic walking, sand yachting, stand-up paddle ... the Eolia nautical base offers many nautical activities for the whole family.